New York architecture studio Diller Scofidio + Renfro has released new images of its spiralling US Olympic Museum in Colorado Springs, as construction on the project officially starts. First unveiled in 2015, the 5,600-square-metre facility will be the only museum in the US dedicated to the legacy of the country's Olympic and Paralympic athletes. It will feature 1,900 square metres of galleries, an auditorium and a broadcast studio placed in four twisted volumes that loop up and around an atrium occupied by the main lobby. Visitors will quickly journey to top but then gradually spiral back down, an experience that Diller Scofidio + Renfro created in reference to "the movement of athletes". "The design idealises athletic motion by organizing its programs – galleries, auditorium, and administrative spaces – twisting and stretching centrifugally around an atrium space," said the firm. As well as twisting around the atrium, the spaces will also open out towards surrounding vistas. At the top, a huge window will frame views of Colorado's Pikes Peak summit. Construction on the museum started earlier this week and a new series of renderings has been released to accompany the news, revealing more details about the design. An image of the main lobby shows that the space will be punctuated by long balconies extended from the floors above. On the exterior, the underside of the volumes will be curved to form a canopy above the entrance. Large expanses of glazing will run along the lower floor. Low-rise steps filled with planting will lead to the a plaza, offering visitors a place to pause, while a glazed restaurant will be built on the other side with a sloped roof topped with a garden. A bridge from the plaza will lead across train tracks to connect with the America the Beautiful Park to the west – a 12-hectare national park within the city. The US Olympic Museum is the kickstart project in a major urban renewal area in downtown Colorado Springs. 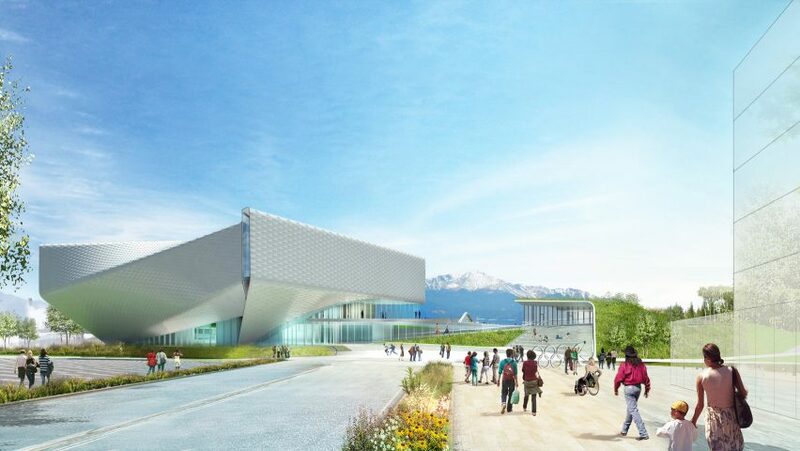 Originally, museum officials had hoped that the building would break ground in 2016 so that it would be ready in time for the 2018 Winter Olympics. Its completion is now slated for 2019. Diller Scofidio + Renfro – which ranked 68th on Dezeen Hot List 2016 – has worked on a spate of museum projects around the US, including the Broad Museum in Los Angeles and an art centre at Stanford University. The US studio is working with global firm Gensler on the major expansion and renovation of New York's Museum of Modern Art, the first phase of which recently completed. Images courtesy of Diller Scofido + Renfro.